Interim Chicago Police Superintendent John Escalante (left, background) listens as Chicago Mayor Rahm Emanuel addresses upcoming changes in training and procedures within the Chicago Police Department on Dec. 30, 2015. 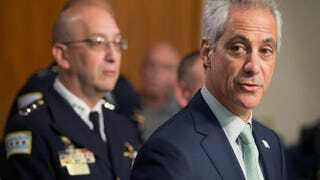 A task force established by Chicago Mayor Rahm Emanuel after an outcry over police shootings has found that the Chicago Police Department has a history of using excessive force against minorities, perpetuates a code of silence and has "no regard for the sanctity of life when it comes to people of color," according to a report viewed by the Associated Press. The Task Force on Police Accountability, chaired by Lori Lightfoot, found that distrust of the police force by blacks and Latinos is justified, with data concluding that the department does little to discipline officers who violate procedure and that what should be considered normal police encounters often turn deadly. According to AP, "74 percent of the hundreds of people shot by officers in recent years were African-Americans, even though blacks account for 33 percent of the city's population." The report, which was conducted over a four-month period and included hundreds of interviews, cited a history of police misconduct dating back to the 1960s and the killing of famed Black Panther Fred Hampton. The report also noted the allegations of torture from 1970 to 1990 and the highly contested stop-and-frisk practices in the early 2000s, AP reports. "Reform is possible if there is a will and a commitment," the report said, according to AP. "But change must start with an acknowledgment of Chicago policing's 'sad history.'" The task force report also noted that police unions have "essentially turned the code of silence into official policy," citing one such contractual bylaw stating that officers can wait 24 hours before providing a statement after a police shooting, presumably giving officers enough time to work through a unified retelling of an incident. The contract also prohibits any officer from filing an anonymous complaint against another officer. Not only are complaining officers required to list their name, but officers listed in a complaint are also notified of who has filed the grievance against them. Union President Sgt. Jim Ade told AP that the union contracts "provide due process in disciplinary procedures, nothing more." Ade added that the idea that the officers' contracts make it easier for them to lie is "ridiculous." Mayor Emanuel declined to speak with AP about specifics in the report, saying that he had not been briefed on the findings and had yet to read the full report. "The pain and the anger and the frustration that people across this city have articulated to us … is something that has to be understood, has to be respected," Lightfoot said during a news conference, AP reports. "It has to be embraced if we are ever to move forward."